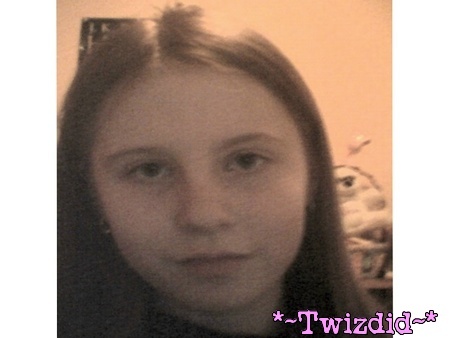 Is that Twiz?? ?Or someone else? Lol...Its fine....DOnt worry about it. Ok...No problem, I am sorry about that..
... ... ... Oki then. I highly doubt I look better then you though. I thought you told me you have red hair....or, is it just the picture? That's not what I thought you'd look like! LOL! Main post edited by me due to hairstyle change! And yes Ryuk it's just the pic, My camera sux. Ty.. The reason it's diff is becouse the first one is happy-go-lucky life is good Twiz a couple months ago, and the second is kill me now plz plz plz Twiz today. lol. 3. text is less girly. 4. you look better in 2 than 1.
you mean other than her trying to kill me in the chatbox everytime shes there and that her sig says that i'm the only one that would be in her deathnote?